Using a good boning knife like the Victorinox 6" boning knife, cube up 2 1/2 pounds of pork shoulder. Place in a large mixing bowl. Cut up 1/2 pound of bacon, place in bowl with pork shoulder. Combine the cherry peppers, chili pepper juice, eggs, bread, and Cattleman's Grill Tri-Tip Seasoning into the bowl. Mix well. 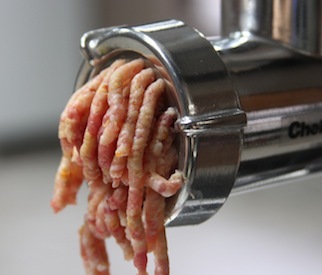 A handful at a time, put the mixture through a meat grinder. 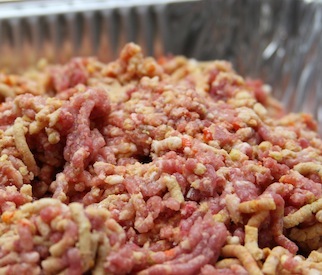 Once the mixture is fully ground, roll out the meatballs and place them in a buttered foil pan. Preheat your Yoder Smokers YS640 (or other grill) to 400°. Cook the meatballs for 15 - 20 minutes or until the internal temperature is 170° (use the Maverick PT-100 thermometer for fast and accurate temperature readings). Serve and enjoy!